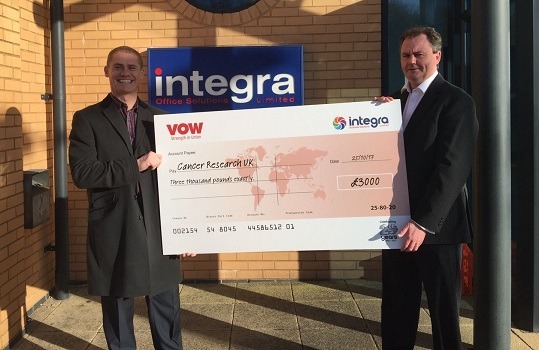 VOW and Integra Business Solutions have together raised £3,000 for Cancer Research UK. The donation was raised through a six-month campaign that saw the wholesaler promote its exclusive brands to Integra members, while Integra organised a charity raffle and auction. VOW also raised funds on its exhibition stand during the dealer group’s national conference, which took place in Stratford-upon-Avon. There, Integra’s gala dinner saw the charity raffle bring-in an additional £2,000 and former England footballer and manager Kevin Keegan auctioning a signed shirt, raising £550. VOW now has 10 exclusive brands, containing products for workplaces and spanning all its product categories.